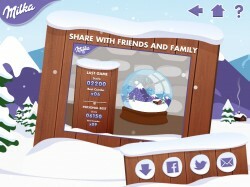 Celebrate the magic of Christmas with the Milka Advent Christmas Countdown app. Explore the snowy alpine world with your real Milka chocolate calendar, and discover a mini games and activities each day. Only available in Austria, Germany and France, the English screenshots you see here are from the development version, not available to the public. This app was developed with the lovely folks at Play Nicely for Mondelez.